Nuse, a research app for journalists is the winner of the NPO Backstage app competition. Open State organized this competition commissioned by the Dutch Public Broadcasting System. On September the 25th the developers pitched their apps. Laurens Vreekamp, who developed Nuse along with his team, was rewarded with 3.000 euro to elaborate on their idea. LessonUp of Kars Veling and his team ended up in the second place, Backstage Insights an idea of Raymond Hoofman third and Trends, developed by Dirk Kloosterboer fourth. Below you can find the (brief) descriptions of all the apps. Nuse is a research platform for journalists. For journalists who do research for a new item / article, Nuse provides access to existing databases in text, audio and video. Nuse uses the NPO Backstage API. Unlike eg. Twitter or Facebook, you can consult the databases directly and you can store the relevant results in your own files, annotate and share with colleagues. LessonUp makes education fun..With NPO Backstage data…! With videos, pictures, useful sites, teachers are able to make their own slides and create an interactive quiz for their students. Backstage Insights is like Google Analytics for the Dutch public media. F.e. the NPO Backstage API makes it possible to measure the popularity of politicians in the media and for example to see how often local politicians appear in the national media. Backstage Insights goes one step further. With Backstage Insights you analyse the data using the key metrics from data science. This app is about the role of public broadcasting in society. What can we conclude about topics, such as TTIP, that get relatively late NPO-attention, while Google search results suggests that these issues were already ‘hot’ in the public spotlight? And what can we say about topics that the NPO paid attention to in a relatively early stage, such as the Arab Spring? With this app you can search on location, to see if there are any related NPO items. For example, you live in Haarlem and you want to know if there was a documentary made about your city. NPO Geo Finder enables you to find the item. The NPO Puzzle Player is an educational video player to watch videos of the NPO. Before you are able to see the video item you have to solve the puzzle. Set the pieces in the right place and the video will play automatically. We often say that there is a lot of negative news nowadays on television. But how negative is it exactly? Treurdier uses the subtitle data in the NPO Backstage API to analyze the sentiment of programs. What is trending on Twitter in the Netherlands? The DSCD widget links NPO items to the trending topics. These topics are converted (via an algorithm) into useful keywords. This widget can be customized for eg. the website of a program or portal so that only fragments and episodes of a specific program are linked to the trending topics. We congratulate the winners and thank all participants for their contribution! Code on! 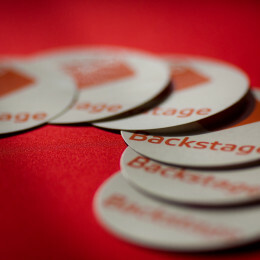 You can now sign up for the NPO Backstage Hackathon on Saturday, November the 14th. Hope to see you there!